FABB is still looking for volunteers to help us expand our organization and advocacy by creating, implementing, and managing FABB’s volunteer programs or by promoting FABB on social and other media. These volunteer duties can be performed at home and require a commitment of no more than 5-15 hours per week. Primary supervisor of FABB’s volunteer recruitment and management efforts. Organize, coordinate and manage the recruitment of volunteers for advocacy, education, encouragement, and fundraising efforts. Provide direction, coordination, and consultation for all volunteer functions. Develop and promote volunteer opportunities to advance FABB’s mission. Develop and implement, in conjunction with the Board of Directors, volunteer training programs. Handle inquiries seeking information on volunteer opportunities. Develop and manage volunteer policies, procedures, and standards of volunteer service. Work with communications coordinator to publicize opportunities for volunteers. Develop and maintain relationships with other volunteer organizations within the area. Create original and engaging text, image and video content for FABB blog, emails, newsletter, and social media sites (Facebook, Twitter, Instagram). Coordinate coverage of all FABB advocacy efforts and fundraising events with local media. Facilitate responses to queries and comments on social media. Stay up-to-date with changes in social platforms to ensure maximum utilization and effectiveness. Track web traffic and viewer interest. Train, as needed, other volunteers and contributors on preparing content for FABB social media. Suggest new ways to attract prospective viewers and members, such as promotions and giveaways. For more information on this position, please contact: secretary@fabb-bikes.org. FABB members, some more opportunities to speak up and make our voices heard about the I-66 parallel trail are planned for next month. All of the hearings will start at 6:00 p.m. and last until 8:30 p.m. with a formal presentation beginning at 7 p.m. followed by a public comment period. The comment period runs through November 29, 2017. 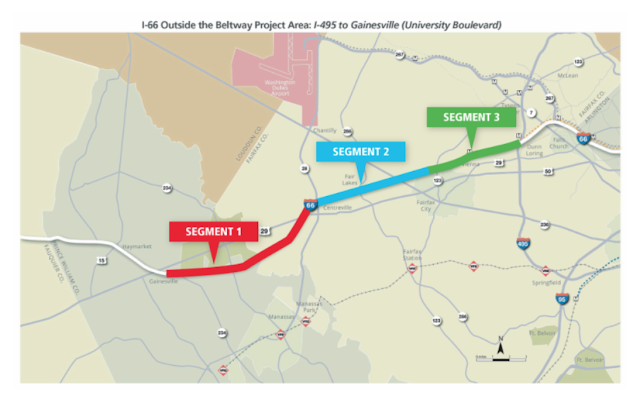 If you are unable to attend the hearings, you can still review project information, including design plans, project schedule, and environmental, right of way and civil rights information, at www.Transform66.org or at VDOT's Northern Virginia District Office at 4975 Alliance Drive, Fairfax, VA 22030. You can email comments to Transform66@VDOT.Virginia.gov or submit them via the online comment form, available at Transform66.org. 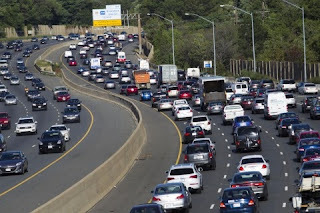 You also can mail written comments to Ms. Susan Shaw, P.E., Megaprojects Director, VDOT Northern Virginia District, 4975 Alliance Drive, Fairfax, VA 22030. Please reference "Transform 66 Outside the Beltway" in the subject line of all correspondence. FABB members, here is a great opportunity to pass along any outgrown or unneeded bikes you have to help others benefit from biking. The Committee for Helping Others, an all-volunteer organization that helps the needy in Vienna, Oakton, Dunn Loring, and Merrifield, is starting its annual Holiday Bike Drive. 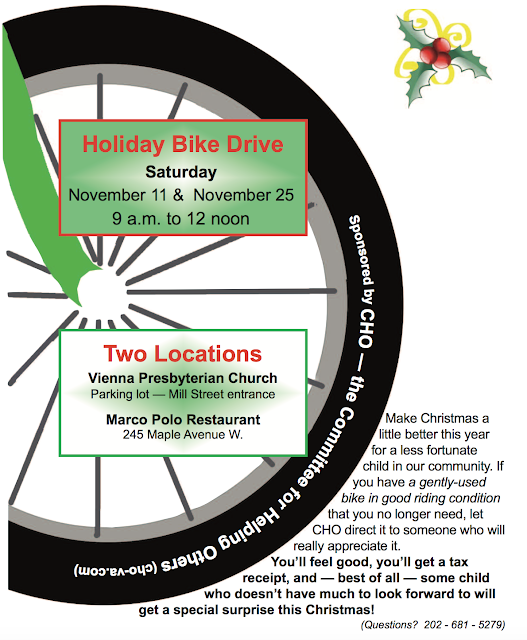 Each year CHO collects used bikes, spruces them up, and gives them to families that could use some assistance during the holidays. With the help of caring people in the area, CHO has been able to give away well over a hundred bikes each year. Collection dates this year are Saturday, November 11, and Saturday, November 25. Collection locations are at the Vienna Presbyterian Church, 124 Park St NE, and the Marco Polo Restaurant, 245 Maple Avenue W, in Vienna. Please pass this announcement along to others you know who may have used bicycles they would like to donate. 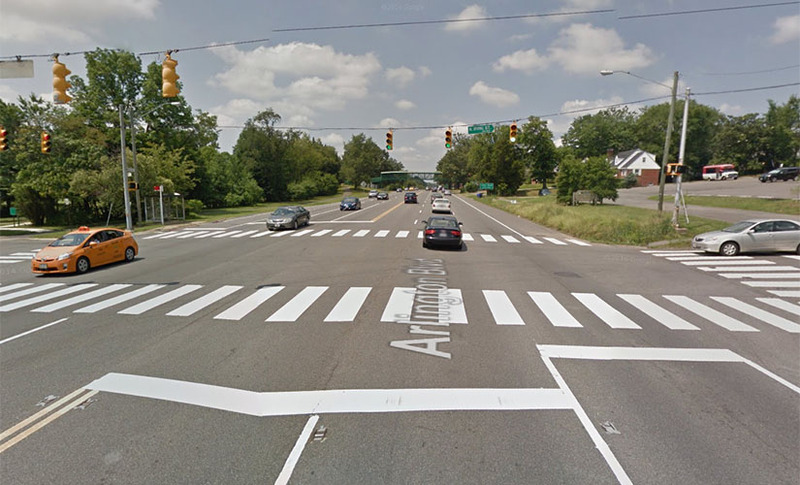 In August we reported on new bike lanes striped on North Shore Drive in Reston as part of VDOT's repaving program. Three more projects are now underway in Reston. Yesterday we noticed a VDOT crew adding sharrows to newly repaved Glade Drive, from Twin Branches to Glade Bank Way. 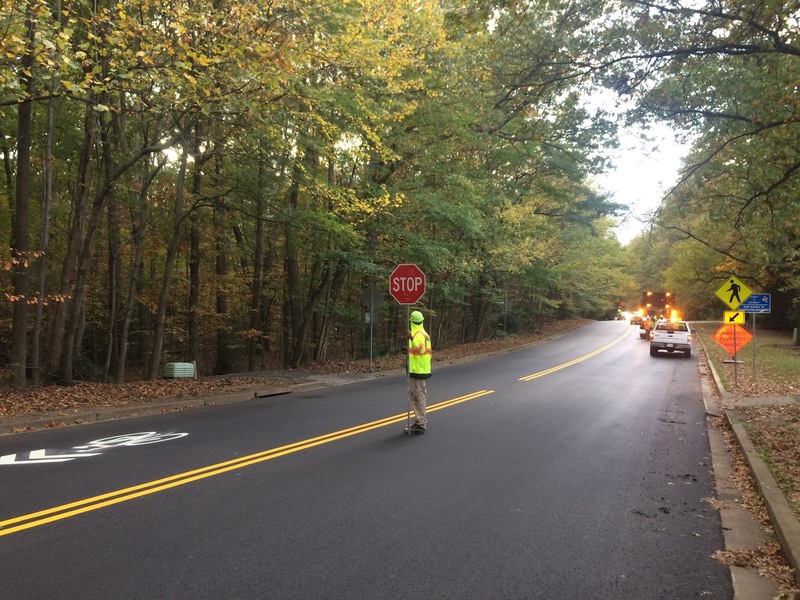 Both Twin Branches and Colts Neck Roads were just repaved and will soon be striped. Twin Branches will have an uphill climbing lane and sharrows on the downhill side bike lanes in both directions. 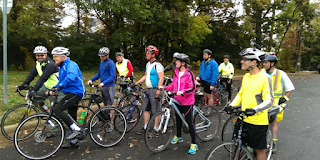 Colts Neck will be reduced from 4 lanes to 2 travel lanes, a center turn lane, and bike lanes between Glade Dr and South Lakes Dr Sunrise Valley Dr. FABB will be holding a FABB Social Ride in Reston in the near future to check out these new facilities. 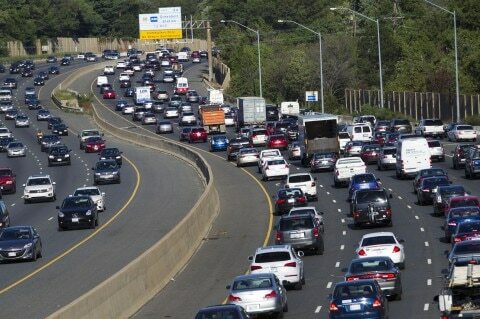 Kudos to Fairfax DOT and VDOT! FABB members in the Tysons area should make plans now to attend two upcoming workshops. 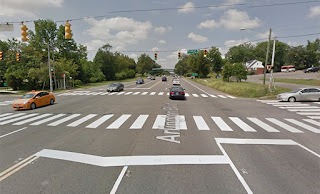 The good news is that the Virginia Department of Transportation (VDOT) is designing a bicycle/pedestrian facility in the vicinity of Old Meadow Road and I-495 in the Tysons area. To get additional input on design elements from the community, VDOT will be holding two design workshops next month. 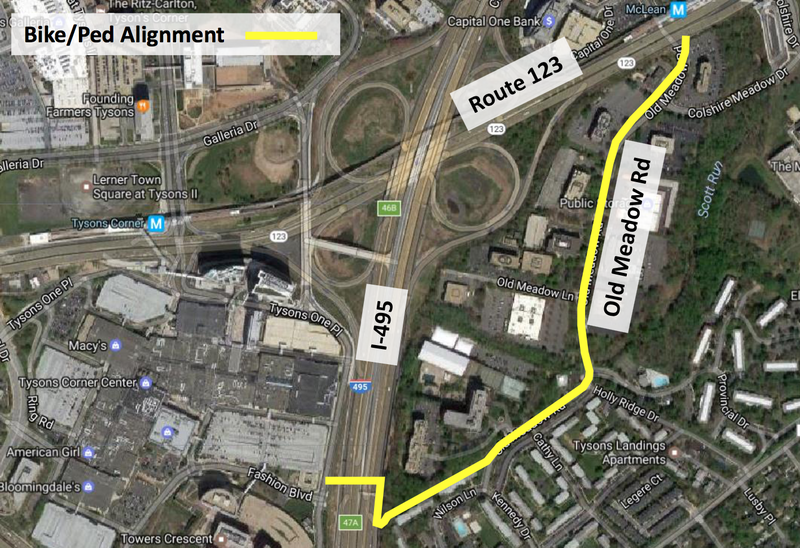 The plan includes a shared-use 10-foot-wide asphalt path along Old Meadow Road from Route 123 to a bridge crossing over I-495 near the intersection of Tysons One Place and Fashion Boulevard. Community input is needed on the design details including security, screening, aesthetics, lighting and architectural treatments that can be accommodated within VDOT standards and the project budget. Westgate Elementary School, 7500 Magarity Road, Falls Church. The second one also will be at Westgate Elementary and will be held on Tuesday, November 28, from 7:00 to 9:00 pm. If you have any questions, contact the project manager, Abi Lerner, by email at Abraham.Lerner@VDOT.Virginia.gov or by telephone at 703-259-3345. FABB Vice President Sonya Breehey joined local officials and advocates at a ribbon cutting for a new segment of the Mason Neck Trail this past Saturday. The celebration was for the completion of the 9,900-foot Segment 2B of the planned 5.5 mile trail that will ultimately connect Rt. 1 to the Great Marsh Trail on the end of Mason Neck running along Gunston Rd. 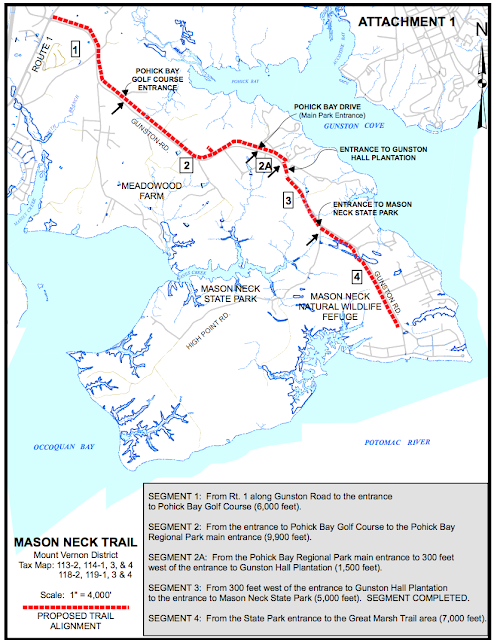 Portions of the trail already built connect from Pohick Bay Golf Course, Meadowood Recreation Area, Pohick Bay Regional Park, Gunston Hall Plantation and High Point Trail in Mason Neck State Park. This $1.6 million project was funded with Virginia Department of Transportation Enhancement Funds and a contribution from Fairfax County. Supervisor Linda Smyth is hosting a Providence District community information meeting on I-66 at Marshall Road Elementary School on Wednesday, Nov. 8, 6:30 to 8:30 pm. This is a great opportunity for FABB’s Providence District supporters to voice their concerns about plans for the I-66 parallel trail and their desire for improvements to the design of the trail. 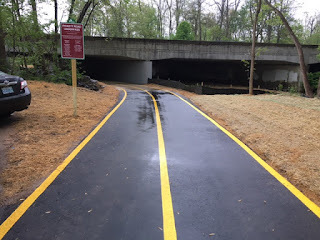 This trail has the potential to connect hundreds of thousands of people to neighborhoods, trails, and transit hubs while providing new recreational opportunities all along the I-66 corridor. Now is the time to speak up to make sure this once-in-a-generation chance to create a trail worthy of Northern Virginia is the . Mark your calendars and please plan on attending. We once again want to encourage everyone to take advantage of a great riding opportunity coming up in November. 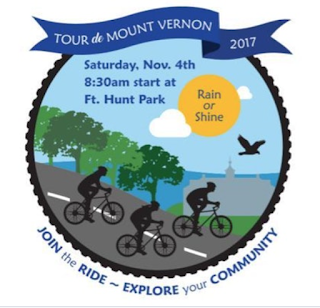 The Tour de Mount Vernon community bike ride will be held on Saturday, November 4, 2017. It will start at 8:30 a.m. at historic Fort Hunt Park. There are options for a 36-mile out and back ride to Mason Neck Park and a 50-mile loop that adds the Workhouse Arts Center in Lorton to the ride. Additional details on the rides can be found here. You need to register by 30 October and there is a $20 registration fee. The fee, however, includes Tour de Mount Vernon bike socks, snacks at rest areas, and hot chili and chips from LaPrima at the end of the ride! Plus $5 of the fee supports FABB. Hey, FABB members, as you may recall, FABB is now part of the Capital Trails Coalition, a collaboration of public and private organizations, agencies, and citizen volunteers working to create a world-class network of multi-use trails that are equitably distributed throughout the Washington D.C. metropolitan region. Such a network will transform public life by providing healthy, low-stress access to open space and reliable transportation for people of all ages and abilities. The Coalition would like your feedback as it develops a unified identity for the existing and planned trail network in the Washington, DC region. The group has a few ideas that it would like to hear your thoughts on, and you'll have a chance to share your own at the end of this very quick survey (truly, it is very quick… two-minutes max). The deadline for submissions is November 6, 2017, so please take the survey today. We'll keep you posted as the process moves along. New Pickett Road underpass in Fairfax City. FABB will hold its October meeting in the City of Fairfax on Wednesday, October 18, from 7:00-8:30 pm (note the earlier start time). Our guest speaker will be Wendy Block Sanford, Fairfax City transportation director. The meeting will be held in the Old Town Hall, 3999 University Drive, in Fairfax. Pleas join us to discuss opportunities to improve bicycling in and around the City of Fairfax. There is bike parking at Old Town Square behind the town hall. Automobile parking is available at nearby surface lots and at the parking deck on University Drive. 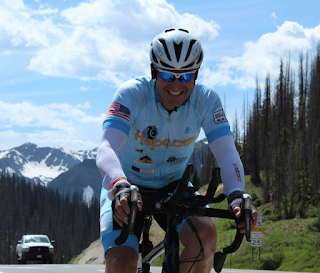 Help Local Endurance Cyclist Reach his Goal for Cancer Kids! It's not too late to contribute to the worthy cause of Reston entrepreneur/endurance cyclist Len Forkas. In July, Len completed the grueling 3,000-mile Race Across America. He was riding to raise $1 million for Hopecam, a service he started to keep kids with cancer connected with school and friends. Whenever Len’s determination flagged, he says, he would think of the Hopecam kids’ everyday fight for life and peddle harder. Len started the non-profit after his own son won a battle with leukemia. Now that he’s safely back home, Len is taking stock of his harrowing journey. He says the heat that melted airplane tires on the tarmac at Phoenix Airport also melted him. He started to hallucinate that the roadside white stripe looked concave and that there was a 3-foot drop between the gravel and pavement. Pulling over in the middle of the night, his crew’s van accidently pinned his left foot. Luckily, he was standing on sand so his foot sunk in and wasn’t crushed, though it did quickly swell to twice its size. Len was 58 when he raced this summer. He competed in the oldest division and came in thirteenth overall. Only 15 of the 38 racers who started the race actually finished. Len also completed the race in 2012, the story of which he recalled at TEDxTysons the same day he flew to California to start the 2017 competition. At one point in the race five years ago, he was so exhausted he fell asleep in the saddle, waking up just before he hit a guardrail along a sheer cliff. I was at the TEDx event and had a chance to speak with Len after he got back this summer. When I asked what he did to avoid falling asleep this time, he said he DID fall asleep, but his crew woke him up by blasting the horn just before he drifted into oncoming car traffic. 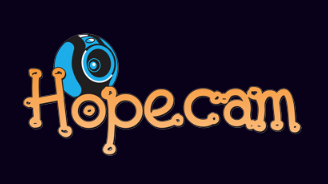 As for where Len trained for this year’s race, he says he avoided the W&OD Trail and trained only in the streets, hitting the road at 4 a.m.
To help Len’s Hopecam cause, please donate here. You can also celebrate Len and his crew’s victory with them at the Tysons Silverline Center on October 19. 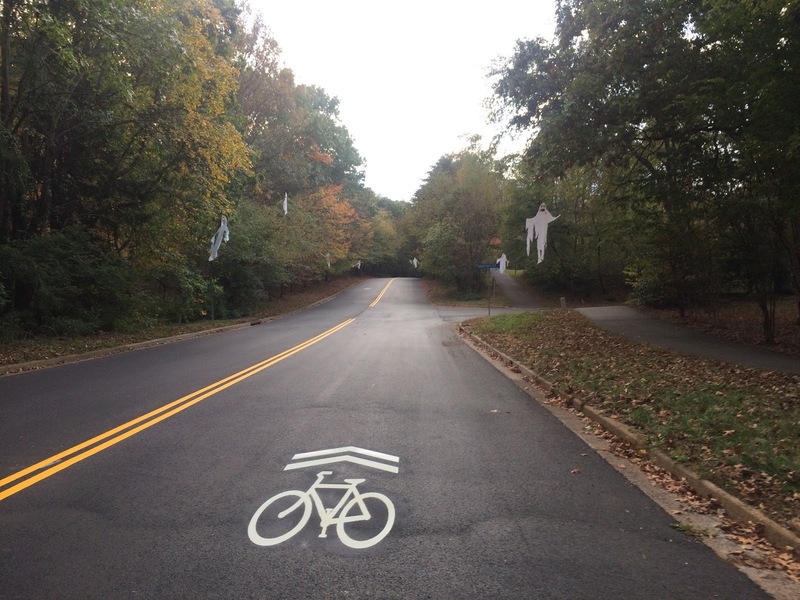 The ride is a 13 mile loop that will showcase the Kingstowne Village Parkway road diet, new buffered bike lanes on Telegraph Road, and the just completed bike lanes on Rose Hill Drive. A comfortable 8 mph pace is planned, with water available at the several commercial areas along the route. The ride will take approximately 3 hours (there is a hill or two!) and we will have a snack pit stop along the way. Parking and start/end point are at the Rose Hill Shopping Center, 6116 Rose Hill Dr, Alexandria, VA 22310. The ride departs at 9am. All riders must wear a helmet. You will be asked to sign a liability waiver before the ride. Alexis Glenn is the ride leader. 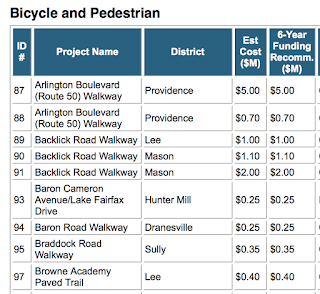 The Fairfax County Board of Supervisors and Fairfax County Department of Transportation (FCDOT) are seeking feedback from the community to help prioritize unfunded transportation projects in the county. The results of this outreach will assist the Board of Supervisors in selecting transportation priorities that can be implemented with existing revenue sources through Fiscal Year 2023, and with additional funding that may become available in the future. The county has identified more than 100 unfunded capital and operating projects important for improving the efficiency and safety of the county's transportation network. These projects are in addition to the approximately 300 projects that are already funded and underway (in the amount of approximately $3 billion). 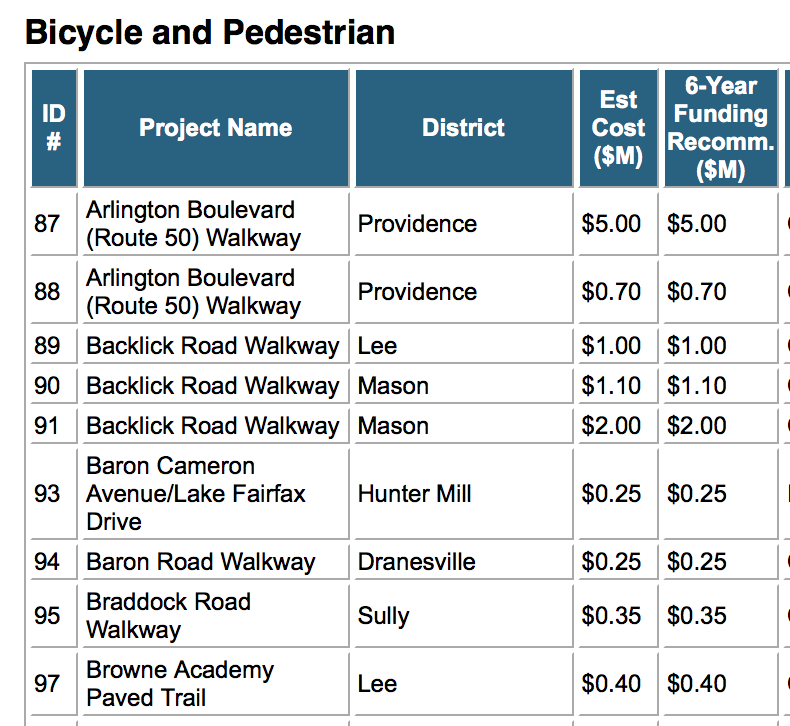 Some of the unfunded bicycle and pedestrian projects. South County Government Center – 8350 Richmond Highway, Alexandria – Wednesday, Oct. 11, 2017, from 7-9 p.m.
North County Governmental Center – 1801 Cameron Glen Drive, Reston – Thursday, Oct. 12, 2017, from 7-9 p.m.
Fairfax County Government Center – 12000 Government Center Parkway, Fairfax – Monday, Oct. 23, 2017, from 7-9 p.m.
Thomas Jefferson Library – 7415 Arlington Boulevard, Falls Church – Monday, Oct. 30, 2017, from 7-9 p.m. If you are unable to attend a public meeting, you can join FCDOT staff for a live Ask Fairfax! online chat on Tuesday, Oct. 17, from noon to 1 p.m.
Take the survey online now! 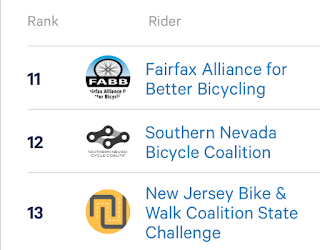 Over 31,000 riders logged over 31 million miles in the League of American Bicyclists’ National Bike Challenge. Between May and the end of September 210 of those riders represented FABB. 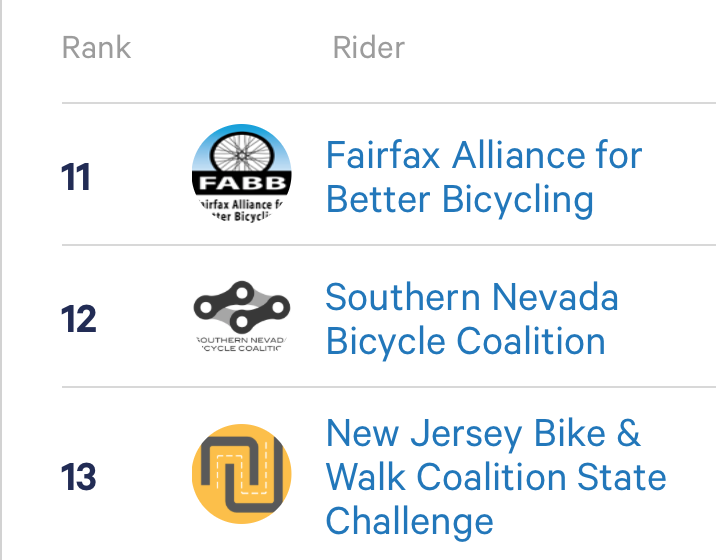 Our members logged enough miles to rank 11th in the nation. Great job, everyone!